Rotary Club of Hout Bay meets Tuesday evenings – 6.30pm for 7.00pm – at Atlantic Boat Club, Hout Bay Harbour. Here is the view from the clubhouse in summertime and this, coupled with good Rotary friendship, will always guarantee an enjoyable evening and worthwhile fellowship. Whilst club rules are relatively informal since Hout Bay is a seaside town, do avoid jeans or slip slop shoes. You will always be made welcome when you arrive but the best plan is to telephone or e-mail the Club Secretary in advance at the South African address in your Rotary Handbook if you are an existing Rotarian. Whilst contact with this website page is effective, messages are only checked fortnightly. Members meet each other in the bar lounge on the first floor from 6.30pm, the Seargent calling the gathering to order for a meeting in our club room at 7.00pm. There is plenty of parking in the Harbour area, the club house being in the A-shaped building at the water’s edge housing the Lookout Restaurant. We consider being invited to become a Rotarian as an honour. We take time selecting and approving membership. Being invited to become a Rotarian means you are recognized as a person of good character with a fine reputation in your business and with communities and are willing to serve the Hout Bay community and Rotary International. Being a Rotarian is seen as being part of a prestigious international organisation. Being a Rotarian gives you worth in other peoples lives. Connect with other passionate people. Club meetings will strengthen your connections with friends and neighbours and form meaningful relationships that last a lifetime. Invest in yourself. Many clubs in our district with whom we liaise organise workshops, conferences and guest speakers – all aimed at helping you grow personally and professionally. Change lives. You will have the opportunity to discuss your community needs and act upon the call made. Vocational Services – sharing personal skills, organising educational projects, administering the bursary program and skills development projects. 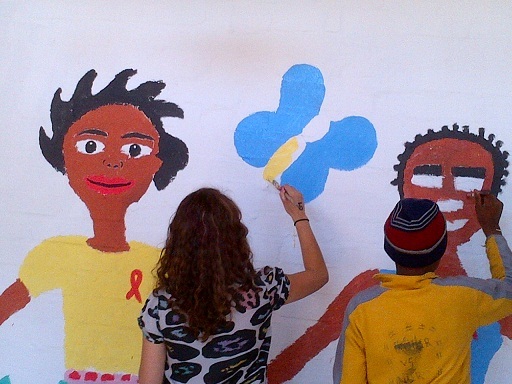 Community Services – implementing and managing projects that improve community life. International Service – expanding the Rotary humanitarian outreach around the world. Youth Services – the most recent avenue of service and covers the development of youth programmes and funding mechanisms for youth projects. 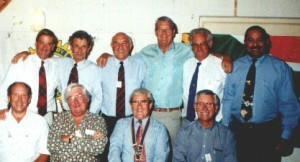 The club was chartered in 1986 as part of District 9350 under the auspices of Cape Town’s Rotary Club of Signal Hill, which acted as “mother” club during those initial years. Still serving is past president Don Peters, one of the original charter members. The club owes much to Theo Vith who was largely instrumental in forming the club and past district governor Ralph Harris, who was the appointed Rotary extension officer at the time of the chartering of Hout Bay to see through the birth of the new club. The club was originally twinned with Rotary Club of Port St Louis of Mauritius but this has fallen away and the club has now most successfully twinned with Rotary Club of Coolamon in New South Wales in Australia, who have assisted enormously with current projects. During the formative years, when numbers stood at about 20 members, the club was a staunch supporter of Rotary International’s “Polio Plus” campaign, Rotary Hout Bay being the first club in the Western Cape province to answer the international call for polio funding. 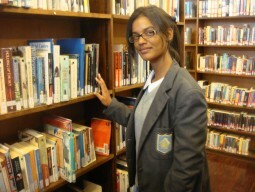 Since then, Rotary Hout Bay has continued to respond to many international calls for help, such as the Haiti disaster, but now tends to focus on the upliftment of its many varied and different poorer communities in the Hout Bay area and the immediate social needs of the town itself and its environment. Thirty presidents later, the club is as strong as ever and recently won District 9350’s “Best Project” prize, continuing its long tradition of “service above self” to the Hout Bay community and surrounding areas. Membership is largely drawn from Hout Bay with a number of members coming from nearby suburbs to attend meetings. Meetings are usually well attended and feature a weekly speaker. 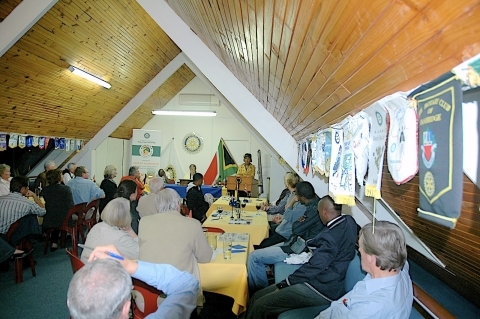 Rotary Club of Hout Bay is unusual in that it has a large number of members who are “swallows” – members that spend a part of their life in other countries. 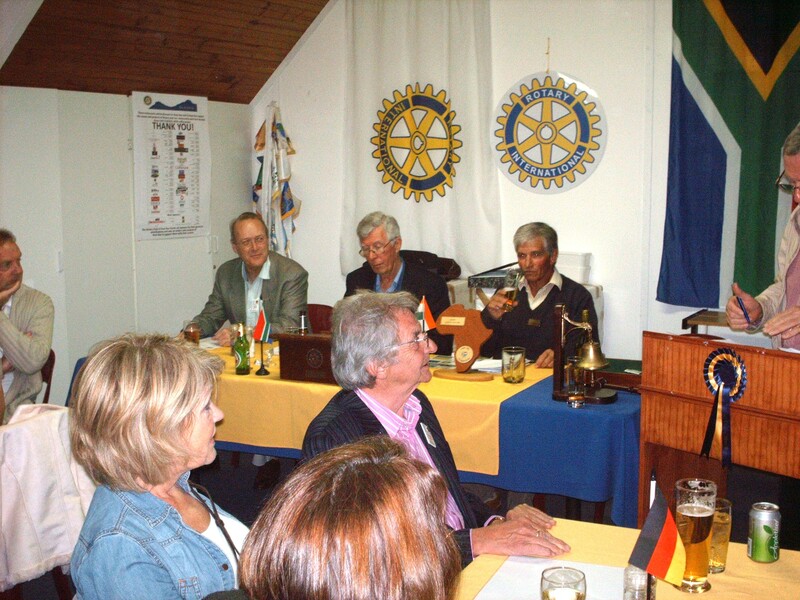 Rotary Club of Hout Bay enjoys their membership usually for six months of the year during the European cold weather.